B & G Sprayer - N-124S Sprayer with 24" extension, is a stainless steel sprayer making it easy to clean. Provides years of drip-free use with the exclusive extenda ban valve meeting labeling requirements for most insecticides. Made in the USA. B & G - N224S-18 - Sprayer holds 2 gallons and comes with an 18\' wand, is a stainless steel sprayer making it easy to clean. Provides years of drip-free use with the exclusive extenda ban valve meeting labeling requirements for most insecticides. Made in the USA. B & G 2 Gallon Stainless Steel Sprayer with a 24" wand. 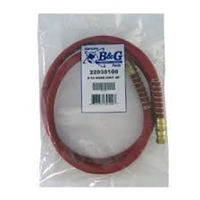 B & G - #P-275 Brass Handle replacement part.